When Malala Yousafzai a year ago, as a 17-year old, won the Nobel Peace Prize, she was its youngest ever recipient. 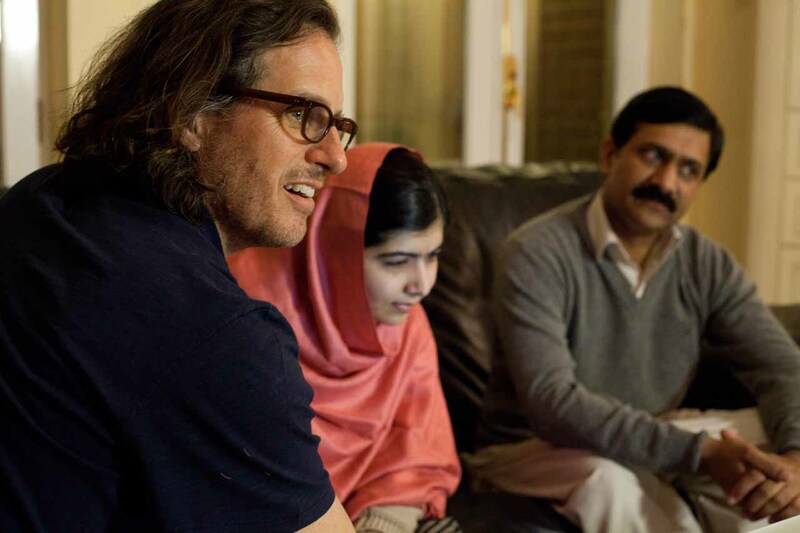 Davis Guggenheim’s cinematic documentary He Named Me Malala concludes with this prize ceremony, and starts by describing the historical figure she is named after. Through one of the film’s regular animated sequences, we are introduced to Malalai, who according to legend spoke to the Pashtun forces during the 1880 battle at Maiwand, when Great Britain attempted to colonise Afghanistan. The brave woman –a teenager – was herself shot and killed, but her inspiring words were crucial in beating the British. He who named Malala Yousafzai after this Jeanne d’Arc-like heroine, is her father, Ziauddin Yousafzai. Malala means courage, he explains in the film, and it is easy to image the obligations of such a name. Perhaps it even became a sort of self-fulfilling prophecy. The parallel between the legend and Malala’s story is evident – apart from the fact that the modern Malala survived the shots that hit her. The fight for education. As is well known, Malala Yousafzai was shot in the head and neck on her way home from school in the Swat-valley in 2012. The motive was her blogging (originally anonymously) for the BBC and later publicly speaking against the Taliban-regime which had recently taken control of the area, and which denied girls education. After receiving treatment at a local hospital, the, at the time, 15-year old girl was taken for further treatment at a hospital in Birmingham. In Great Britain, she and her family were given residence permits, and still live in the same city. The horrific event made Malala world famous, both as a symbolic and a real front figure for human rights in general and, in particular, for girls’ right to an education. On her birthday, 12th July 2013, a day which is now named Malala Day, she spoke in public for the first time since the Taliban’s assassination attempt. The speech was for the UN at their New York headquarters, and the topic was again children’s right to an education. Since then, Malala has continued to fight for fundamental rights, and has met many of the world’s most powerful people, including both Obama and Bono. In fact, she was herself on the front of Time Magazine as one of the world’s 100 most influential people. Recently, Malala came runner-up in Time’s Person of the Year contest, one year after being awarded the Nobel Peace Prize. Last year, she also launched the book I am Malala, co-written with journalist Christina Lamb, and which the documentary He named me Malala is partly based upon. Regular teenager. Concurrent with being a world famous and obviously busy young woman fighting for the right to education globally, Malala has to follow up on her own schooling. Despite all her extraordinary merits and mature observations, she is more or less still a normal teenager. This is something the film points out rather charmingly – as when her brothers describe her as naughty, and when we see her google sports and film stars that she finds attractive. She is also evidently her father’s daughter. He Named Me Malala also portrays her father, Ziauddin, a teacher and activist who has clearly passed several of his values on to the main character, and whom she seems quite attached to. Less of a prominent part in the film has Malala’s mum, one of the many women who was denied basic education – but she has strong opinions. Although in a lesser extent to her husband and daughter. Despite the fact that she has a lot to thank her dad for, Malala emphasises that he only named her, he did not make her into Malala. By this, she means that the choices she has taken were her own. I would also assume that she is surrounded by a network beyond that of her family, however, film does not reveal much about this. Breadth rather than depth. Do we know her by now? Is the type of question you tend to ask after such a portrait. Not sure. I do not assume that she had much to hide in the first place, but the film could definitely have provided more of a close-up of Malala both as a human and a phenomenon. Although the film paints an interesting picture of her life up until the Peace Prize ceremony, it exemplifies the type of film which in its ambition to cover a lot, does not give itself the opportunity to delve deeply. And, strictly speaking, it does not contain much that we did not already know about the main character. The film’s most intense moments are found in the featured archive footage, as when Malala is on TV, using her full name, denouncing named Taliban-leaders whilst still living in Pakistan. The film’s most intense moments are found in the featured archive footage, as when Malala is on TV, using her full name, denouncing named Taliban-leaders whilst still living in Pakistan. This indicates that the film maker could have been more present during vital moments of her current life – not least in the run-up to these moments when there is a chance of getting close to both the person and her motivation. Wide reach. Director Davis Guggenheim has previous experience from (future) Peace Prize winners through An Uncomfortable Truth (2006), the Al Gore campaign documentary to create attention about global warming. Among his earlier documentaries, are the rock guitarist encounter It Might Get Loud (2008), and Waiting for ‹Superman›, the latter depicted the US educational system. In addition, Guggenheim is an experienced TV-director, with a CV boasting episodes from NYPD Blue, ER, 24, The Shield and Deadwood. It is not necessarily anything wrong in any of this, but it may just be that his experience have impacted on the polished nature of He Named me Malala. Despite being both well executed and well told, the film could have had more edge. Unsurprisingly, the He Named Me Malala soundtrack comes courtesy of Hollywood-veteran Thomas Newman, who recently created the film music for the James Bond film Spectre and Spielberg’s Bridge of Spies. Newman’s emotionally-driven score is just one of several elements in the film that indicate a wish for the widest possible catchment. The same goes for the director’s prioritising of interviews over a more observational approach, plus the aforementioned animated sequences. It is of course positive that Malala and her sympathetic message reach as many as possible. This accessible version of He Named Me Malala makes it also ideal for educational performances, of which I hope there will many. It is hardly necessary to recap the extreme ideology that attempted to silence Malala (and which according to her, is nothing to do with Islam), has neither declined nor become less threatening of late. This means that it is even more important that she is heard – also because she is a Muslim voice. On the other hand, such a polished and arch-American documentary would also reinforce the impression of Malala as a type of brand. And as for the evil tongues who deem her a puppet created in the self-righteous and Islam-hostile image, Guggenheim’s film will probably add more fuel to this fire. He Named Me Malala premiered in Norway on December 11th, and is now available nationwide.